Lyn is a lightweight photo browser that allows you to organize your images as you see fit. Lyn performs this nifty trick by using a folder organization that you create within the Finder. This gives you complete control over how your images should be organized. Lyn can also access the most common Mac image libraries, including iPhoto, Photos, Aperture, and Lightroom. This versatility makes Lyn a good candidate for a replacement image browser for anyone moving on from Aperture or iPhoto, or who isn't happy with the newer Photos app. Fast; displaying and working with images is nearly instantaneous. Versatile browsing interface provides plenty of choices. Works with existing popular image libraries. Batch image file type conversions. EXIF and IPTC viewing and editing. Built-in map for viewing where images were shot. Doesn't support events, faces, or other iPhoto and Aperture organizations. Image editing is very basic. Installing Lyn doesn't require any special precautions; simply drag the app to your /Applications folder. Removing Lyn is just as simple. If you decide Lyn is not for you, just drag the app to the trash. If you've used iPhoto, Photos, Aperture, or Lightroom, you may be surprised that Lyn doesn't use an image library; at least, not like the ones you're used to. This is the key to why Lyn is fast; it has no database overhead to update and organize while it’s displaying images. Instead, Lyn uses the common folder that the Mac’s Finder creates. You can add and remove folders within Lyn, or do it with the Finder. You can even do both; set up a basic image library in the Finder using nested folders, and then add to or fine-tune it while you're using Lyn. This reliance on standard folders explains why Lyn doesn't support organizational structures, such as events or faces. But Lyn does support smart folders, which you could use to create a somewhat similar method of organization. Smart folders used by Lyn are really saved searches, but because they're saved and stored on Lyn’s sidebar, they're easily accessed and appear just like any other folder. With smart folders, you can search for flagged, rated, label, keyword, tag, and filename. If you add an event keyword to an image, you could recreate the event organization available in other image browser apps. Search: Includes any smart folders you create. Devices: Where any cameras, phones, or other devices that you've connected to your Mac will appear. Volumes: Storage devices connected to your Mac. Libraries: Provide quick access to Aperture, iPhoto, or Lightroom image libraries you may have on your Mac. Places: Commonly used Finder locations, such as Desktop, your home folder, Documents, and Pictures. Images are shown in the Viewer, which resides next to the sidebar. Like the Finder, you'll find various views available, including Icon, which shows a thumbnail view of images in the selected folder. The Split view shows smaller thumbnails and a large view of the selected thumbnail. In addition, there's a List view that shows a small thumbnail along with the image's metadata, such as date, rating, size, aspect ratio, aperture, exposure, and ISO. Editing is performed in the Inspector. Lyn currently supports editing EXIF and IPTC information. You can also edit GPS information contained in an image. Lyn includes a Map view that will display where an image was taken. Unfortunately, while the Map view can show where an image was taken if there are GPS coordinates embedded in the image, you can’t use the Map view to generate coordinates for the image, a feature that would be very handy for all the pictures we have with no location information. For instance, we have an image of tufa towers taken at Mono Lake in California. It would be nice if we could zoom into Mono Lake, mark the position where the image was taken, and have the coordinates applied to the image. Maybe in the next version. Lyn also has basic image editing capabilities. You can adjust color balance, exposure, temperature, and highlights and shadows. There are also black and white, sepia, and vignette filters available, as well as a histogram. However, all adjustments are performed by a slider, with no automatic adjustments available. There's also a nice cropping tool that allows you to set an aspect ratio to maintain when cropping. While the image editing is basic at best, Lyn does allow you to use external editors. We tried out Lyn’s ability to round-trip an image through an external editor and found it worked without issues. We used Photoshop to perform a few complex edits, and once we saved the changes, Lyn updated the image right away. 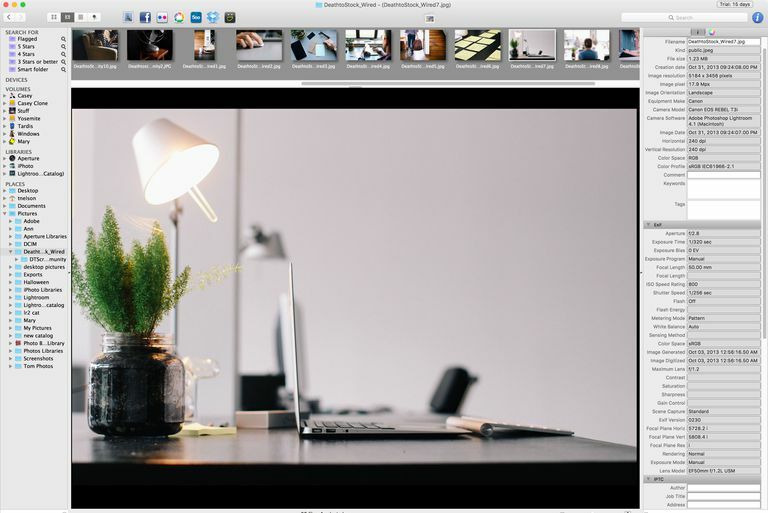 Lyn is a fast and inexpensive image browser that, when combined with your preferred photo editor, can make a pretty good workflow system for hobbyist and semi-pro photographers. Without an internal library system, Lyn relies on you to manually create your image library using the Mac’s folders. This can be a good thing if you don't like having your images managed for you blindly in a database system, but it also requires you to keep on top of the folder structure you create. Lyn has a free 15-day demo available.